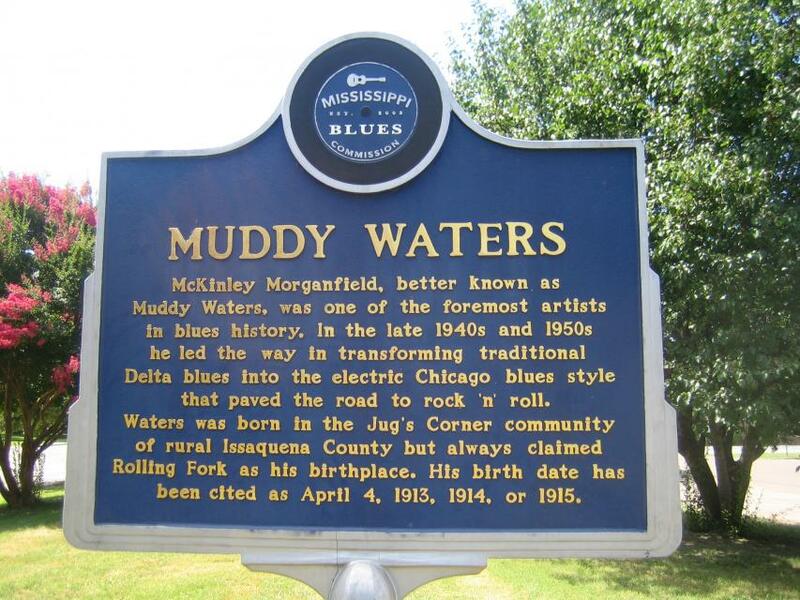 McKinley Morganfield's grandmother, Della Grant, nicknamed him "Muddy" because, as a baby on the Cottonwood Plantation near Mayersville, he loved to play in the mud. Childhood playmates tagged on "Water" or "Waters" a few years later. His father, Ollie Morganfield, was a sharecropper in the Rolling Fork area who also entertained at local blues affairs. But Waters was raised by his grandmother, who moved to the Stovall Plantation near Clarksdale when he was still a young child, and his influences were Delta musicians such as Son House, Robert Johnson, and Robert Nighthawk. Muddy first played harmonica with Stovall guitarist Scott Bohanner, but took up guitar under the older musician's tutelage, and later performed with another mentor, blues legend Big Joe Williams. He also played in a string band, the Son Sims Four, and drove a tractor on the Stovall Plantation, where he ran a juke joint out of his house. Waters did his first recordings at Stovall in 1941-42 for a Library of Congress team led by Alan Lomax and John Work III. In 1943 he moved to Chicago, and by the end of the decade he was setting the pace on the competitive Chicago blues scene. The city was loaded with freshly arriving talent from Mississippi, Arkansas, and Louisiana as southern farm workers continued to migrate to the alleged "promised land" of the north. 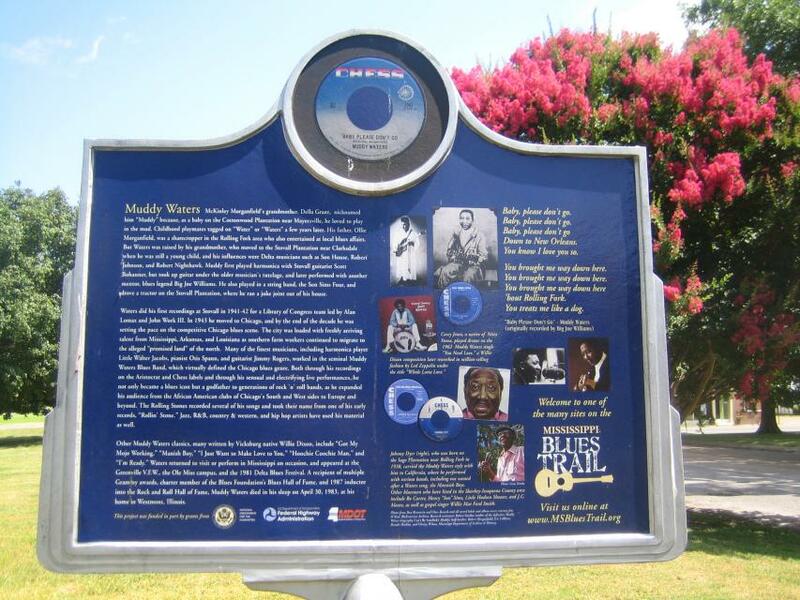 Many of the finest musicians, including harmonica player Little Walter Jacobs, pianist Otis Spann, and guitarist Jimmy Rogers, worked in the seminal Muddy Waters Blues Band, which virtually defined the Chicago blues genre. Both through his recordings on the Aristocrat and Chess labels and through his sensual and electrifying live performances, he not only became a blues icon but a godfather to generations of rock 'n' roll bands, as he expanded his audience from the African American clubs of Chicago's South and West sides to Europe and beyond. The Rolling Stones recorded several of his songs and took their name from one of his early records, "Rollin' Stone." Jazz, R&B, country & western, and hip hop artists have used his material as well. Other Muddy Waters classics, many written by Vicksburg native Willie Dixon, include "Got My Mojo Working," "Manish Boy," "I Just Want to Make Love to You," "Hoochie Coochie Man," and "I'm Ready." Waters returned to visit or perform in Mississippi on occasion, and appeared at the Greenville V.F.W., the Ole Miss campus, and the 1981 Delta Blues Festival. A recipient of multiple Grammy awards, charter member of the Blues Foundation's Blues Hall of Fame, and 1987 inductee into the Rock and Roll Hall of Fame, Muddy Waters died in his sleep on April 30, 1983, at his home in Westmont, Illinois. This marker can also be identified by its HM code. You can use the hashtag #HM1IP4 in tweets, and any other place where you might refer to this marker, including when searching on this site.